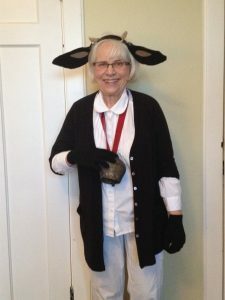 Last week’s blog about my being asked to play a cow at the Christmas Eve service for small children prompted several comments, including requests for a photo. I asked a teen who was playing a camel in the drama to take my picture before the service began, and posted the result on Facebook before I went to bed. Please enjoy this blog post, essentially written for me by my creative, loving, zany friends and family. Friend who wins prizes for her humour writing: Do we get to see a pic of you in your Ho-Ho-Holstein get-up?? Sister: You’re making me all e-moo-tional! Friend of sister and, a writer and lyricist: Will you be using any special moo-sic? Sister: Do you mean, “The cattle are mooing; the poor baby wakes”? Sister’s friend: Moo-re than likely. Son: I hope the performance went sMOOthly. Friend from church in Guelph: Oh Wilda, I miss seeing the true you, in your fun outfits. Friend from Guelph Little Theatre days: Hope you have a Dairy Christmas! Thanks for providing me with a lot of joy this Christmas, folks. This levity was made possible because I said “Yes” in 2016. Yes to writing, yes to sharing my words, and yes to portraying a talking barnyard animal on Christmas Eve. Who kn-ooo? This entry was posted in Writing on December 28, 2016 by Wilda.